Government norms and regulations for the automotive industry are playing an instrumental role in shaping the automotive market, especially in the European region. Winter tires have been specifically developed for extreme winter conditions such as hailstorm and snowfall. All-season tires are designed for all-weather conditions and perform sufficiently well. However, winter tires provide an extra level of safety and comfort while driving in extreme winter conditions. Moreover, usage of winter tires can help in the reduction of a collision on roads with sub-zero temperature by one-half. Therefore, the use of winter tires leads to improved acceleration, handling and braking characteristics. These performance advantages and benefits increase the value proposition of winter tires, thereby driving their demand in the market. As per Technavio, the use of new tire compounds for improved flexibility will have a positive impact on the market and contribute to its growth significantly over the forecast period. 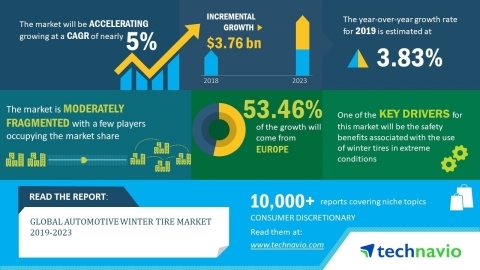 This global automotive winter tire market 2019-2023research report also analyzes other important trends and market drivers that will affect market growth over 2019-2023. Currently, winter tire vendors are seen spending more on efficient tread designs and side profiles as well as improved traction capabilities. Research and development (R&D) activities are improving the overall performance and reliability of winter tires for optimum results. Vendors are also focussing on making the tires more fuel efficient and environmentally friendly. Vendors have introduced new winter tires for passenger cars, especially sedans and minivans. They have also released tires for use in heavy-duty pickup trucks and SUVs, which improve handling and control in harsh winter conditions. These tires are made of a new rubber compound, which offers a longer tread life, thereby resulting in extra miles. Therefore, such advances are in the winter tire market are expected to drive the growth of the market during the forecast period. "Apart from the use of new tire compounds for improved flexibility, the increasing demand for environment-friendly tires, and advances in the field of tire retreading are some major aspects that are expected to boost the growth of the overall global market during the forecast period," says a senior analyst at Technavio. This market research report segments the global automotive winter tire market by application (passenger vehicles and commercial vehicles) and geographical regions (Europe, North America, APAC, South America and MEA). The European region led the market in 2018, followed by North America, APAC, South America and MEA respectively. During the forecast period, the European region is expected to register the highest incremental growth as the region witnesses significant snowfall during the winter season which necessitates the use of winter tires.